Successfully Added The Constable - CCTV Security Camera with SONY Super HAD CCD to your Shopping Cart. Waterproof Night Vision CCTV Security Camera with Sony Super HAD CCD video sensor. 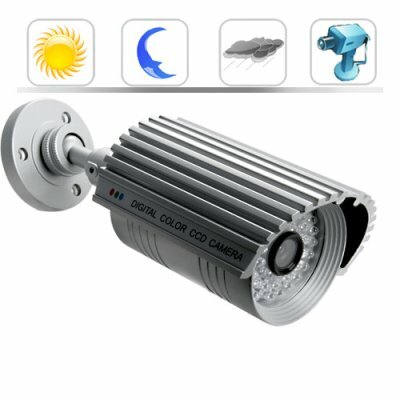 Protect your home and business with this powerful high-quality outdoor surveillance camera with 48 (IR) LED's and an advanced Super HAD Sony CCD. Anyone concerned about security will appreciate the durability and high-quality video footage of The Constable. It provides super clear resolution of 625TV lines along with a long viewing range, making this powerful camera perfect for keeping an eye on the outside of your home or business all day and night, rain or shine. The 1/3 inch Super HAD Sony CCD lens gives you an astonishing high quality image and wide viewing angle, while 48 infrared (IR) LED's provide superb night vision, even in complete darkness. The Constable may be small, but its built with high grade weatherproof aluminum, a 1/3 inch Super Sony CCD lens and 48 LED's, giving you only the best surveillance footage you have ever seen from a security camera - guaranteed!! The heavy-duty aluminum casing protects this camera from water, stormy weather, falling debris, and even vandalism, the sun-shield can be adjusted, which further helps protect the lens and deter unwanted daylight away from the iris. Installing and positioning this camera exactly where you want it is easy and takes a mere few minutes to completely install The Constable. We know what you must be thinking, "shouldn't a CCTV Security Camera this good be selling for at least $300?" You are right! However, with the exclusive Constable CCTV security camera, you are getting the same quality the Chinese Police and German Military use, but at a low factory-direct wholesale price. For maximum home and business security Start the new year with increased security and complete peace of mind, the CVJZ-J25 is proudly brought to you by - Chinavasion. That's because the Constable CCTV security camera with SONY Super HAD CCD is is smaller in scale, so less raw materials were used in its construction and it does not feature and extra video feed. What does the Super HAD meen? Super HAD (HAD, stands for Hole Accumulation Diode). Super HAD CCDs have much closer spacing between microlenses, thus further increasing the light collection efficiency. Meaning, much, much better quality images than ever before. How does Super HAD CCD actually work? Super HAD CCD's made by Sony work by placing two micro lenses on top of each photo diode, which enables the CCD video sensor to collect more photon from incoming light than the old CCD, and the result is a far better image quality. Like my other feedback (cellphone) in the same shipment , thanks for a perfect transaction. Will recommend your site. Fantastic camera , value for money. Count me in your steady and fix customer group.